The library is an integral part of the overall resource provision of the school. It is run by a full-time qualified librarian, with invaluable assistance from student library monitors, prefects and students undertaking their DofE volunteer module. 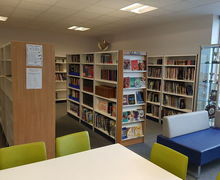 The main aims of the library are to encourage and support reading for pleasure, to provide resources in support of the curriculum and to provide students with the facilities and support to research for themselves, complete their Independent Learning and revise for exams. 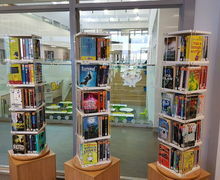 The library subscribes to the Accelerated Reader (AR) scheme for all Year 7 and Year 8 students and we have almost 4,000 fiction and non-fiction titles included in this. Click on the link opposite to find out more information about AR and to learn how you can support your child with their selection of AR books. The Library from Steve Bailey on Vimeo.